WASHINGTON—Declaring that the mourning period for the recently deceased 41st president was “just getting started,” a spokesperson announced Thursday that the incredibly popular George H.W. Bush funeral would go on an extended two-week run. “Based on the outpouring of support we’ve seen for a president who the public views as representing a more respectable era of American politics, we’ve decided to bring the nationally renowned George H.W. Bush funeral experience to 12 more cities across the country over the rest of the month,” said Jim McGrath, spokesman for the late president, adding that “Thousand Points Of Light: George H.W. Bush In Memoriam” was slated for three nights in Texas before returning to Washington, D.C. for an encore funeral, and then the president’s casket would be loaded into a newly commissioned Boeing 747 for his “final resting flight” that would barnstorm across the country, including three sold-out nights at St. Patrick’s Cathedral in New York City. 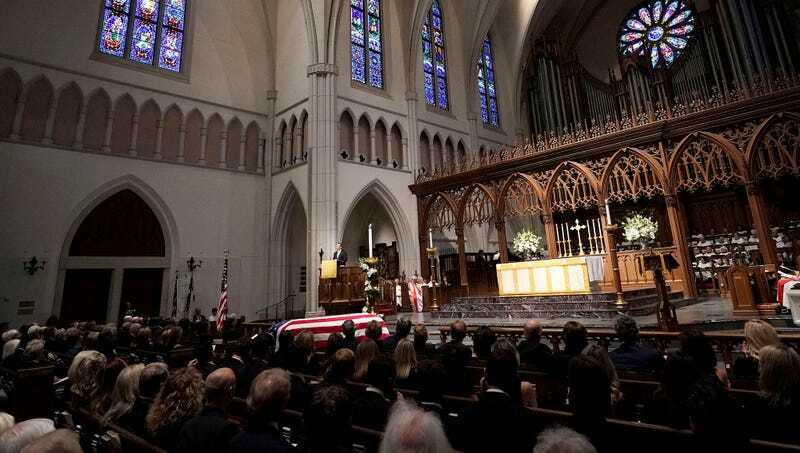 “Besides the president’s casket, accompanied as always by Sully the service dog, we’ve got a star-studded lineup of eulogists, including Jeb Bush, President Bill Clinton, Vice President Dan Quayle, several of the late president’s grandchildren, and on the funeral tour’s Christmas special at the All Saints’ Episcopal Church in Beverly Hills, President George W. Bush will host a never-before-seen photo montage of the 41st commander-in-chief’s life. For those who can’t make it to see the deceased president in person, don’t worry—it will be broadcast around the clock on ABC, NBC, and CNN, plus live-blogged on The New York Times in its new Salute To 41 vertical, so the nation has several chances to say an extended goodbye to the beloved president one last time. This is truly the patriotic mourning event of the decade, and it is not to be missed.” At press time, the late president’s spokespeople announced that due to its popularity, “Thousand Points Of Light: George H.W. Bush In Memoriam” had added a year-long residency in Las Vegas at the MGM Grand.